Coming up on October 2 at The Blanton is "Turner to Monet: Masters from the Walters Art Museum". When you go -- take a short trip upstairs to the Manuel Bravo exhibit. I went with two photography friends, Andrea Turner and Ashley Unbehagen and had a lovely afternoon. 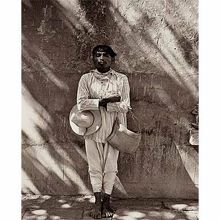 The show features Manuel Bravo andsome of his contemporaries such as Bresson and Kertesz who are two of my all time favorites. We took our time taking in each photograph. Then went back and each picked out our top five and why. The gentleman at the left made all of our lists. On display in the center of first room was the book The Family of Man by Carl Sandburg and Edward Steichen. 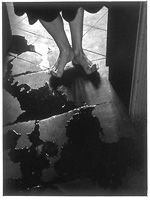 It documented an exhibition curated by Edward Steichen in 1955 at the Museum of Modern Art in New York. It included 503 photos by 273 photographers in 68 countries. Somehow I had never run across this book before. Ashley commented that her parents had given it to her for a Christmas gift many years ago. I just added it to my birthday list for my folks. Visit the museum cafe next time you go to the Blanton. The portobello sandwich is delicious. A nice little getaway afternoon is just a few minutes away.